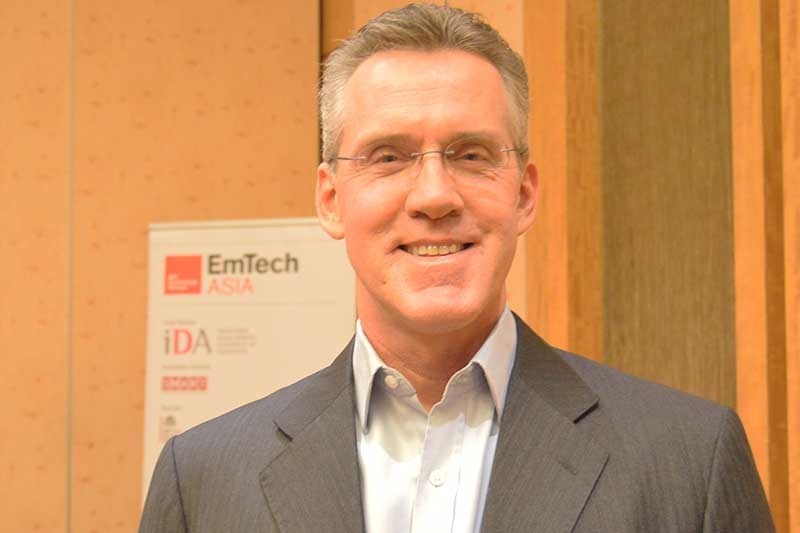 Recently, Steve Leonard, Executive Deputy Chairman for IDA, reflected on the Smart Nation journey while presenting at EmTech Asia. He foresees that the nation will change dramatically, disrupting our regular routines as we know it, and predicts a day where we live with pervasive connectivity. OpenGov sat down with Steve Leonard himself, to discuss his foci for the year, the importance of collaboration, and why commercialisation of tech will feed a Smart Nation. What are your key objectives for the year? We are focusing on playing our part for the Smart Nation Journey. We are trying to help build the communications infrastructure that allows more information to be moved around. We are trying to encourage startups and innovation, because in order to build a Smart Nation, you have to build cool stuff. We are trying to work with a lot of corporates by bringing them into the community. We are also working a lot with the universities to get more cooperation on research. We have got to try and bring a lot of different parts together to pursue this Smart Nation journey. When I say journey, it is because it is a mindset. This is different because a lot of governments try to have a very defined program. This is okay but we are also trying to see if we can be better at a little more exploration. At the EmTech conference, I shared the amazing example of the telegraph. Before the telegraph, you could only move a piece of information anywhere within weeks. With the invention of the telegraph, you could move information within a handful of minutes, which created a lot of disruption. We are trying to think: what does disruption mean for health or what does it mean for energy? We are trying to work in a collection of things. With respect to cyber security, how would you assess the current threat landscape? We are always concentrating on cybersecurity as it is a continuous effort to improve the security landscape. Everything that we build and everything that we look at has to start from a security-first standpoint. There are a lot of partnerships and relationships to improve cybersecurity. For example, Interpol recently opened a major new facility here. We are also working with universities to facilitate more research. Security was always important before and now, even more so. Collaboration is highly emphasised as one of the key drivers of Smart Nation. What are some of your favorite examples of innovation and collaboration in Singapore? One of the things we would really like to see would deal with the ageing population. Singapore has a tripling of its ageing population within the next 14 years. Due to this, you have to think of a couple things such as health for those individuals and moving those individuals. If you had to transport someone from their home to their caregiver, that would usually be done by his or her child or relative. Now, because the family demographics are changing, there may not be that kind of capability as much in the future. We may need to find a way to move them, whether it be an autonomous vehicle or some kind of technology-oriented transportation that would help the ageing population. This intersects with health because you could care for someone at home, before you need to bring them to a health care facility. If you have a person with a chronic care condition who needed to be monitored through IoT or wearables, you could have medical dispensing at their area through thumbprint authentication, and personalised medicine based on their genome. These different areas are intersecting with each other to create a better situation for the ageing population. This collaboration drives our vision for a Smart Nation. Can you talk about Singapore’s work in collaborating with other countries, such as the UK? In the UK, London Mayor Johnson is a tech advocate and PM Cameron is a tech advocate. We have spoken with Parliament and the House of Lords to see where we can cooperate. There is government to government cooperation, tech company to tech company cooperation, and university to university cooperation. Just recently we made a new investment in a talent development team that is opening in Singapore. This will help us take lessons from the UK universities that turn innovators into entrepreneurs, to see what we can do with the local universities. We do a lot with UK, but this does not mean we do not do things with Israel or parts of the US or other nodes of innovation, which are doing amazing things too. Why is commercialisation of technology so important? Essentially, if you think of what has happened in the United States, a lot of what the government wanted in the past helped drive what built Silicon Valley. Here we got radars, radio transmitters, and so on. If that had not been thought of as going into the commercial world, if it was just a government thing for government use, then a lot of what we see today would never be around. We do a ton of research in Singapore but we have been less focused on the commercial aspect. We are trying to drive more towards this commercialisation aspect. How do we get young people excited about technology? We need to make it something that they want to be involved in. The challenge is that sometimes tech is perceived as work in a sort of grungy basement job where you get a call early in the morning to fix things. There is not anything in the world that is not linked to tech. What we are trying to do is reposition it from: “don’t think of tech as a person linking cables together”, but think of it as a creating something which could save lives.